These five-foot diameter concrete “monoliths” are drainage pipes left over from construction of the NJ Turnpike. 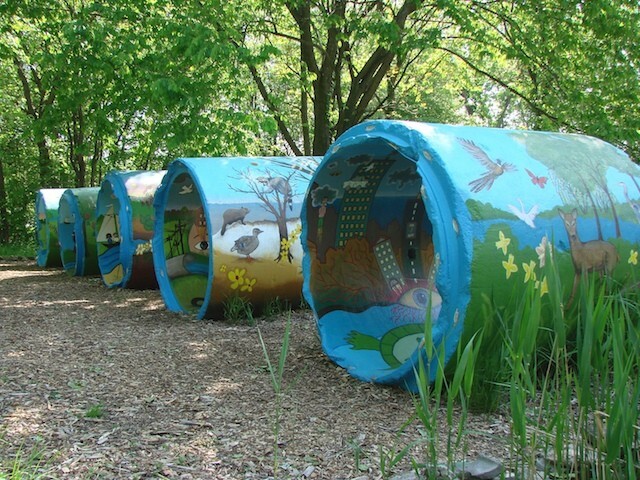 In 2008 TCC commissioned muralist Eduardo Alexander Rabel to lead school children and volunteers in creating a pictorial history and future vision of Teaneck Creek Park. The five pipes were designated to represent historic eras: prehistory, European colonization during the 18th Century, industrialization of the 19th Century, the 20th Century, and the Future. The inside of the pipes depicted the human aspects of each era and the outside represented the environmental features or degradation associated with each time period. The Future Pipe illustrates two pathways – a sustainable environment or continuing degradation – we hope the children’s sustainable vision comes to be!